Beyond is a bookazine dedicated to new, experimental forms of architectural and urban writing. In the second issue of Beyond there is an excerpt of Douglas Coupland's new novel, "Generation A," and contributions from Lieven de Cauter, François Roche and many others. 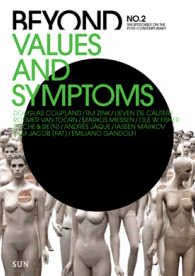 The theme of this edition is 'Values and Symptoms': "The uncertainty of the present moment, accompanied by symptoms as fear, social imbalance and cynicism defines an interesting turning point. We need to question which are the values we want to pursue and represent in the urban landscapes of today. Where do we find the groundings on which to rebuild pragmatic optimism and shared goals for our daily life?" says editor in chief Pedro Gadanho. Douglas Coupland, Roemer van Toorn, Sam Jacob, Andrés Jaque, Francois Roche, Triin Ojari, Markus Miessen, Iassen Markov, Ole W. Fischer, Lieven de Cauter, Emiliano Gandolfi, Rui Zink, Nuno Coelho & Adam Kershaw, Bert de Muynck and Marc Schuilenburg.